Hunter College occupies a distinctive place in American higher education. We remain devoted to a particular and uncommon social mission—giving students from diverse backgrounds and modest means the opportunity to complete curricula defined by high intellectual expectations. Our graduates embody the too-rare promise of renewing democratic leadership in American society. To this Hunter has added a greater focus on scholarship, research and creative activity. Hunter also plays an increasingly important role within New York City as a training ground for critical professions that meet essential human needs. In this strategic plan, we reaffirm our commitment to the goals of student success, significant scholarship and service to our city. Success rests on the willingness of all to share ownership of these goals and help translate them into practice. The Hunter of tomorrow must continue to embody the best of Hunter past and present. Circumstances encourage the ambitious reimagining of who we are. Hunter College has been the beneficiary of exceptional favorable publicity in recent years. Popular college guides have ranked us among the best-value schools in public higher education in the United States. They note our location, in the heart of one of the world‘s most exciting cities, as an enormous advantage. The City University of New York now recognizes Hunter as the leading liberal arts college in the system and as one that should expand its focus on research. We have become the first-choice school for more applicants from within the city than any other CUNY campus; our honors programs attract large numbers of intellectually talented and ambitious students. The new CUNY School of Public Health will operate under our auspices. In a key move toward full university status, Hunter now offers its own doctoral programs in certain sciences. Faculty personnel policies that offer reassigned time for research to untenured faculty and better terms for sabbaticals have facilitated the recruitment of research-minded scholars. Finally, with the renovation and reopening of Roosevelt House as a center for public policy research, teaching and public programs, we have an extraordinary facility for elevating our role and visibility in selected public policy arenas. Other conditions, though, will test our capacity to achieve our goals. The years ahead promise to be lean ones for the state budget, and we cannot depend on tax-levy funds to meet our needs. Finding additional resources becomes a community challenge and a collective responsibility, and we will need to be creative and entrepreneurial in tapping new sources of support. Important resource policy questions—such as whether individual campuses within the state higher education system will be granted autonomy to set their own tuition rates—remain unresolved. We also operate within the CUNY system and must respond to various mandates while we strive to sustain the uniqueness of a Hunter education and assure the quality of the degrees we award. Finally, notwithstanding personnel policies that have given faculty more time for research, countervailing pressures arise from the heavy teaching load that reflects CUNY labor-management agreements and CUNY administration calls to increase the percentage of courses taught by full-time faculty. We can state clearly what we aspire to be when we have realized the plan—a research-oriented, student-centered university. If we succeed, we will become CUNY‘s version of an elite public university, the one that others identify as the system‘s flagship. Certain benchmarks distinguish great public universities. At their core, they feature outstanding liberal arts programs across the humanities, the sciences and the social sciences. They cultivate productive and accomplished faculty, who in turn insist that students meet high expectations in the classroom and become partners in the scholarly enterprise. They also boast of outstanding graduate and professional schools and programs, with particular strengths that set them above their peers. Yet Hunter will stand out among top public universities through its ongoing commitment to a profound democratic purpose—educating people from diverse backgrounds and meeting the needs of our city. The Research Imperative. Hunter College has increased significantly its research profile and achieved new highs in external grant support, exceeding $50 million in each of the past two years. This research concentration extends across all schools, liberal arts and professional, while assuming a form appropriate to each one. As we move forward, we need to review the College‘s processes, infrastructure and partnerships to assure that all elements support an intensified research focus. A particular challenge lies in balancing faculty research expectations with the heavy teaching load. Student Success. Our new mission statement affirms high standards for our students. In framing this mission, we have made explicit what has long been true: Hunter College believes in the capacity of students from diverse backgrounds to meet demanding expectations and then make a significant impact on the world around them. We believe student success is a shared responsibility and we propose coordinated initiatives in and beyond the classroom to help students learn and progress through their studies and graduate. Interdisciplinarity. The future of scholarship points toward the breaking down of walls between fields of inquiry, even as important conversations continue within established disciplines. Hunter has taken a leading role in encouraging scholars to work together across disciplines. We have housed the Schools of Public Health and Social Work together because so many pressing social problems need to be addressed from both perspectives. Other recent initiatives, such as the Roosevelt House programs in public policy, human rights, and LGBT (lesbian-gay-bisexual-transgender) studies, have positioned Hunter College to make its mark as an emerging university through cross-disciplinary innovation. Resource Development. Like other research-oriented universities, Hunter must become more aggressive and creative in pursuing resources. We will all be asked to become more entrepreneurial, to be attentive to opportunities to tap new sources of funds or engage in revenue-generating activities for the College. While appreciating the complex issues involved in seeking tuition flexibility, we recommend that the College discuss whether this approach (offset by scholarship support) makes the most sense in an era of diminished state support. Institutional Connections. Hunter‘s location gives us rich opportunities to forge partnerships with neighboring institutions, a process the administration has started. Our main campus lies within a few blocks of some of the world‘s preeminent medical research institutions, and we are actively exploring how to expand ties between these facilities and Hunter College scientists and healthcare professionals. Some of the decisions we make about locating new facilities should be guided by proximity considerations that will enhance the appeal and effectiveness of our programs. Information Technology. Hunter College has dramatically upgraded its information technology infrastructure over the past several years, leaving us poised to keep pace with extraordinary changes in how people access information and communicate. Looking ahead, we will integrate technology into teaching and learning, add state-of-the-art technology to a revitalized library and use technology to promote the exchange of ideas and improve communication among all campus constituencies. The CUNY Connection. Hunter‘s ambition to become a leading public university fits well with the broader CUNY vision of an integrated university system consisting of colleges with different roles and meeting different needs. Our focus on professional programs of exceptional quality that serve New York City fulfills a core CUNY purpose. Similarly, by insisting on rigorous academic standards and drawing a large cohort of honors students, we help CUNY retain some of the brightest academic talent emerging from the city‘s high schools. As part of our reinforced focus on student success, moreover, we will expand efforts to make sure transfer students from within the system receive the support they need to meet Hunter curricular expectations. Not to be overlooked, Hunter faculty members also play a key role at the CUNY Graduate Center, teaching courses and supervising dissertations. We will continue to respond creatively to evolving CUNY priorities. The strategic plan consists of several elements. It begins with a new mission statement for the College, a critical document because it informs everything that follows and because we must expect to be held accountable for demonstrating that we are fulfilling the mission we identify. Next, we offer a vision statement that expresses, in aspirational language, where we hope Hunter College will be ten years from now. We have also included a statement of the core institutional values that find expression in the mission statement and in our strategic goals. These introductory sections lead into the body of the plan, which lays out five major strategic objectives, each with subsidiary goals. In the brief conclusion, we outline next steps in the institutional planning process. Hunter College of the City University of New York, a distinguished public university, values learning in the liberal arts and sciences as a cornerstone of individual development and a vital foundation for a more just and inclusive society. Continuing our long tradition of expanding opportunity, we seek students from all backgrounds to engage in a rigorous educational experience that prepares them to become leaders and innovators in their communities and in the world. Hunter also contributes to intellectual discourse by supporting excellent scholarship and creative activity by its accomplished faculty. Hunter undergraduate, graduate and professional curricula challenge students to think critically—to approach problems from multiple perspectives, distinguish the questions each raises and recognize the kinds of evidence each values. The College‘s academic programs stress the significance of human diversity, emphasize research and artistic creation, and invite students to extend their education beyond campus. We cultivate the qualities our graduates need to thrive in their chosen careers and make a difference as active citizens. We embrace our setting at the heart of New York City—we seek to draw on its energy, capitalize on its remarkable resources, weave it into the fabric of our teaching, research and creative expression, and give back to it through our service and citizenship. By 2020 Hunter College will have made significant progress toward an ambitious goal—becoming a research-oriented, student-centered university. With its rising reputation for innovative scholarship, Hunter will begin to be mentioned in the same breath as some of the great American public research universities. Yet the College will also be renowned as an institution devoted to student success that invites students to participate in a rich and challenging learning experience. Our faculty will produce important and influential scholarship across both established disciplines and emerging interdisciplinary fields. With improved laboratory and research facilities, Hunter will claim a higher profile in the sciences, and will attract outstanding graduate students to its newly established doctoral programs. Faculty in our illustrious professional schools will forge stronger partnerships with agencies and non-profit organizations that serve the people of New York City. Roosevelt House will swiftly gain a reputation as one of the city‘s go-to places for programs of broad interest on public policy issues. Unlike some universities that sacrifice teaching to build their research credentials, Hunter College will achieve the unusual by becoming still more celebrated as a center of teaching excellence. New faculty will be introduced to successful teaching strategies. Excellence and achievement in the classroom will be recognized. Staff of the several academic learning centers will be encouraged and supported to develop new and innovative models to facilitate student learning. We will find new ways to use the city around us to enhance students‘ educational experience, from internships in public and nonprofit agencies to placements in medical school laboratories to opportunities in the many cultural institutions and media organizations located within a few blocks of our main campus. Students will find themselves challenged to broaden their horizons—to recognize that as future leaders, they need to study other languages and cultures, learn to examine problems from multiple perspectives, master information technology, communicate well in both writing and speaking and meet higher expectations than they may have thought possible of themselves. As a community of faculty and staff, we will be more attentive to our responsibilities to our students. They will receive better advising about course selection, career opportunities, and degree programs appropriate to their interests. Improved course scheduling will make it easier for students to get seats in the classes they need to graduate on time. Through assessment, an active teaching and learning center and the sharing of best classroom practices, faculty will target their classroom efforts to improve students ability to learn. We will enhance the quality of student life, including more cultural events, student activities and leadership development opportunities. Students will enjoy the time they spend on a campus that hums with the energy of the city. Nestled among the classrooms will be areas designated for extracurricular activity, intra-curricular support and relaxation. The Library will be a multifaceted learning engagement and research center. Hunter College will be a vibrant physical presence in the Upper East Side, thriving on our three major campuses: the main Lexington Avenue site at 68th Street, the 119th Street Samuel and Lois Silberman School of Social Work, and the new science center. Weekend programs, lectures, art exhibitions and more will draw our neighbors to Hunter as never before. Hunter will be what it has always been: a center of educational excellence. But it will rise to embrace its destiny as a nationally renowned institution worthy of being a model for the public university of the 21st century. Academic Excellence and Intellectual Rigor. We emphasize excellent and significant scholarship, high-quality research and outstanding creative expression. We push our students to meet high academic standards, to deepen their appreciation and understanding of their intellectual and cultural heritage and to expand their intellectual horizons. We all seek to become better learners and problem-solvers. Diversity. Intellectual growth and innovation emerge from the interaction of people from different backgrounds, challenged to reconsider their beliefs and assumptions. Borders and barriers are shifting, falling and opening across the world, and members of the Hunter community need to be ready to operate in this more fluid social environment. Intellectual Innovation. We seek to push the frontiers of knowledge, both in and outside the classroom. Our multiple disciplines and several schools should serve as points of departure for fruitful discourse across conventional academic boundaries. with public and nonprofit agencies across the city to use our skills and talents effectively. Democratic Opportunity. Like other public universities, we educate many students of modest means, but we do so with very high standards in the expectation that they will leave Hunter and by their example and leadership unsettle established elites and rekindle democratic possibilities. Accountability. We should deliver on what we promise to do. In making commitments to educate, to serve, and to study we also need to take affirmative steps to assure that we are fulfilling our pledges. Inclusion. Our success as an institution depends upon the contribution of everyone—full-time faculty, adjunct faculty, staff, students and alumnae/alumni. We encourage the fullest involvement of all constituencies in College discussion and decision-making. Openness. Ours is a large, multi-campus institution that challenges us to keep all constituencies fully informed of and engaged in issues, debates, events and opportunities. Over the next ten years, Hunter College will achieve the following goals. We seek to enhance Hunter College's academic identity as a research-oriented university that continues to offer a rigorous curriculum and place a high value on teaching. We will extend our efforts to promote significant scholarship, research and creative activity. Our undergraduate curriculum, with an emphasis on research and creative activity, critical thinking, understanding diversity, foreign languages and cultures, clear expression and quantitative reasoning, will challenge students to expand their limits. Graduate and professional education will become more fully engaged in the organizational fabric of the city. Reflecting the principle of one Hunter, we aim to integrate more effectively the various parts of the College, capitalizing on the synergies that exist when we make intellectual boundaries more permeable. We will support and value effective teaching by both full-time and adjunct faculty and encourage the use of classroom technology to improve the learning experience. Encourage and support faculty scholarship, research and creative activity. Recruit, mentor, develop and retain a diverse and exceptional faculty. Support unsponsored scholarship and creative activity, particularly in fields with limited external grant funding. Address creatively the heavy faculty teaching load to encourage greater faculty research activity. Recognize the full range of scholarship, including the scholarship of teaching, in the tenure and promotion process. Raise Hunter‘s profile as a major scientific research center. Establish a secure institutional foundation for the sciences, including increased research space and enhanced leadership. Create a foundation for faculty success in the sciences through better guidance, adequate start-up support and transparent expectations. Improve and rationalize funding for Ph.D. students to meet the needs of Hunter‘s expanding doctoral programs in the sciences. Pursue a research focus in the professional schools that recognizes their important connections to New York City. Recruit, hire and promote faculty with strong applied research profiles, as appropriate. Establish a plan, with a suitable infrastructure, for the professional schools to support interdisciplinary research, collaborative activities and community institutional partnerships. Identify and pursue funding for doctoral students in the professional schools. Use Roosevelt House to encourage faculty collaboration on research on social issues and connect Hunter scholars to the broader New York City intellectual community. Increase opportunities for student research and creative projects in the arts. Reinforce the elements of undergraduate liberal arts and sciences that distinguish Hunter College within CUNY and promote academic rigor and innovation. Improve student writing, quantitative reasoning, public speaking and presentation skills across the curriculum. Broaden students‘ global awareness through the study of languages and by promoting in-depth knowledge of world cultures, including study abroad. Reduce obstacles to and increase incentives for cross-disciplinary curriculum innovation. Strengthen and promote the professional schools and graduate/professional programs within Hunter and CUNY. Place and mentor effective professionals in high profile jobs. Establish additional dual-degree programs and interdisciplinary courses among the professional schools. Create more opportunities for internships, translational research, training and program partnerships and job placements. Establish advanced degree programs as appropriate, including doctorates, in line with disciplinary and professional trends. Promote the development of skills that students will need as citizens and members of the workforce in the 21st century. Achieve student competence in information literacy and the use of appropriate information technologies. Introduce, formalize and publicize pathways from undergraduate majors into professional graduate programs at Hunter. Increase internships and off-campus creative opportunities, while assuring that field work maintains high academic standards. Increase support for excellent, innovative pedagogy. Reinvigorate the teaching and learning center. Promote the systematic exchange of information about best practices in the classroom, drawing on the expertise of faculty from all Hunter schools. Expand mentoring efforts to improve the classroom performance of both full-time and adjunct faculty. Recognize and reward excellent teaching. Promote the use of technology in the classroom and modernize instructional space to capitalize on new instructional technology. Hunter College will marshal its resources to promote student learning, retention and timely graduation. Success in higher education depends significantly on the energy students invest in learning. With that in mind, we will seek to instill in undergraduates an appreciation of the value of a liberal arts education and engage them in their education as active, collaborative participants. Improved advising at all levels will help students clarify their academic and career goals and pursue focused academic plans. Expanded co-curricular offerings will result in a richer college life including cultural events, internships, student activities and leadership opportunities. A carefully designed enrollment strategy will attract appropriate applicants for our academic programs, and ensure that we offer needed courses. To meet the distinct needs of graduate students, who make up one-quarter of the student body, we will upgrade administrative, advising and financial support. Develop orientation programs, guidance and tools to help students early in their academic careers to connect their interests and abilities to possible majors and career options. Communicate the value of a liberal arts education to students‘ career and life goals. Establish accurate expectations of Hunter College academic time demands and standards among first-time college and transfer students. Expand transition services and activities for new transfer students. Engage academic programs/departments in helping students make progress toward their degrees and generating among them a stronger sense of engagement in the learning enterprise. Make annual schedule planning more systematic to increase seat availability in high-demand courses, particularly those that fulfill the General Education Requirements and graduation requirements. Design department/program academic road maps for students to facilitate planning of course offerings at the discipline/major level. Promote student-faculty interaction at the department level to foster the sense of academic community among faculty and student majors. Encourage active and collaborative teaching and learning in order to engage students with individual faculty and their disciplines. Promote extracurricular, cultural, athletic, and recreational activities to increase interaction with other students and encourage faculty and staff involvement. Recognize the specific needs of graduate students, ranging from housing to career services, and coordinate planning across schools and programs to meet those needs. Recognize the distinct curriculum and career advising needs of entering transfer and first-time students and provide tailored guidance to them. Enhance academic advising through increased use of technology, faculty and staff training, and the provision of appropriate advisement at all ability levels. Identify students at high risk of attrition, address their needs before they face serious academic difficulty, and continue to assist them throughout their time at Hunter. Recruit, support and retain an intellectually ambitious and racially, ethnically, culturally and socio-economically diverse student body. Coordinate recruitment efforts and admissions practices with program availability and course offerings so that students‘ expectations are aligned with what is available. Improve dedicated funding and support for graduate students, including placement services. To make certain we deliver on our promise of a high-quality education, we need to expand our assessment efforts, taking care to respect faculty autonomy and to offer ongoing administrative support of faculty-driven assessment. Assessment should extend to the many support services that contribute to student success. The College relies heavily on others besides full-time faculty members, and we recommend expanded efforts to engage staff and adjunct faculty more fully in the community. Given the fragmented character of campus life in a large urban university, we should also invest in improved means of communication to assure that everyone has the fullest information about all things Hunter. Provide adequate administrative resources to facilitate academic assessment. Develop optional templates for program and department self-studies and annual reports that include assessment efforts and results. Engage in regular assessment of administrative offices and practices, especially those that influence student outcomes and/or involve cooperation between academic, advising and administrative units. Evaluate how effectively administrative policies and practices contribute to recruiting, retaining and graduating students. Make easily available updated information on administrative strategies, goals and targets, and outcomes. Focus each administrative department on its role in advancing the College‘s mission. Continuously assess administrative offices and business practices to create efficiencies, promote sustainability and reduce or avoid costs. Foster the development of faculty leadership at the department level and in College administration. Recruit, develop and retain a diverse and talented staff. Encourage the fuller participation of staff in College initiatives and co-curricular activities and solicit staff input to help meet administrative challenges. Expand professional development opportunities for all staff. Broaden opportunities for adjuncts to engage with the College and participate in activities on campus. Develop and implement a comprehensive alumni relations plan to engage Hunter alumni in diverse and ongoing relationships with the College and its current students. Redesign the College web site to make it the "go-to" source of information about Hunter for both current and prospective members of the campus community and, ideally, a forum for the lively exchange of information and ideas. Use communications and technology, oriented around user needs and preferences, to integrate faculty, adjuncts, and staff more effectively into the Hunter community. Develop a transparent comprehensive calendar for all administrative and planning processes and events/deadlines. Promote effective and creative informal/alternative channels of communication among Hunter constituencies that address ad hoc communication needs and support and build on individual media preferences. As Hunter‘s enrollment, research level and breadth of campus activities have grown, the College is increasingly constrained by the limitations of its physical facilities: lack of space now threatens Hunter‘s ability to sustain the recognition and quality it has achieved. We will add space to increase seats in high demand courses, expand laboratory capacity, facilitate increased collaboration across disciplines, schools and programs, and create a stronger sense of Hunter community and affiliation with the College among students, faculty and staff. Perform a comprehensive campus-wide study of physical space utilization to establish a baseline of room use, and update it regularly thereafter. Develop a comprehensive campus facilities master plan that identifies Hunter‘s space needs, prioritizes them, and delineates short- and long-term options to address them. As part of the master planning effort, identify external space that might meet College needs, and work with CUNY and local community boards to determine the steps Hunter should take to secure the space. Seek creative means to optimize Hunter‘s existing space. Provide new dedicated space for the sciences, identifying space that can become available quickly while continuing to work toward breaking ground on a new science facility. Develop and implement a strategic technology plan. 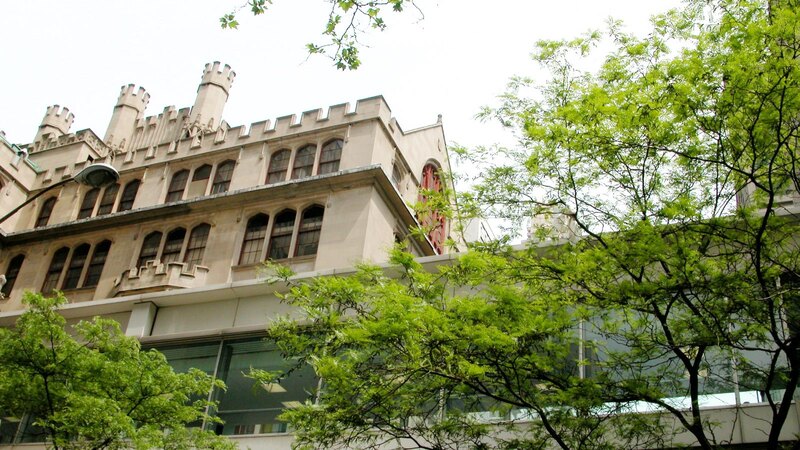 Renovate the Wexler Library at 68th Street to incorporate current modes of information management and encourage student interaction and collaboration. In an era of diminishing state support Hunter College will need to become more creative about attracting the resources the institution needs to achieve its objectives. We will seek to make ourselves more visible and build upon our identity as a public university that captures the great energy of the city around it. Moving forward, everyone at Hunter will need to participate in increasing our resources. The College must tap both traditional and new funding sources more aggressively than ever before, in ways consistent with Hunter‘s mission. Create an identity (or—brand) for Hunter that clearly conveys its distinctive attributes, and use this brand consistently in communication with constituencies within and outside of the College. Increase the profile of Hunter public programs, both scholarly and artistic, to elevate the College‘s presence in and contribution to the city. Increase the public profile of Roosevelt House as a Hunter College landmark. Expand the role of faculty, staff, and students in targeted fundraising and donor cultivation. Define short- and long-term funding requirements and develop budgets and plans to meet various specific targets, including but not limited to programmatic, student services and capital funding needs. Continue to increase Annual Fund yield in order to generate fungible resources in addition to the more dedicated/restricted fundraising of other development areas (e.g., bequests, major gifts, corporate donations etc.). Prepare and execute a comprehensive corporate and foundation relations strategy. Strengthen and reorganize Hunter‘s research infrastructure to facilitate sponsored faculty research. Reevaluate research funding processes to achieve greater efficiencies and encourage greater faculty entrepreneurship in seeking external funds. Identify and tap new and non-traditional research funding opportunities, including granting agencies, corporations, and foundations. Develop and expand partnerships with area organizations and institutions that will bring new human resources to Hunter, provide facilities, increase the College‘s course offerings and/or potentially reduce costs through economies of scale. Aggressively increase the College‘s non-tax-levy revenues through its Auxiliary Enterprise Corporation. In cooperation with relevant faculty and governance structures, explore the potential of high-margin executive-education programs that target demand in the New York City region and are suited to Hunter‘s academic strengths. Evaluate the potential of non-degree academic and co-curricular programs targeted toward members of the College‘s surrounding community. Hunter College‘s strategic planning process does not end with formal adoption of a plan. No plan can resolve all of the challenges and tensions that we face as we pursue several very worthy goals. The model we have chosen to embrace—the university that defines itself in terms of student success at a high level, important scholarship and creative activity, and dedicated public service—sets Hunter College apart. At the same time, to realize this model we must continue to engage in identifying possibilities, testing and evaluating them and examining the interplay of complex, interwoven elements. To facilitate prompt implementation of the plan, we have appended the four task force reports that include numerous possible actions the Hunter community may wish to consider. As part of the follow-up process, various assessment measures should be designed promptly so we will be able to evaluate progress toward meeting our strategic goals. Progress reports, including assessment outcomes, should be presented to the Hunter College Senate periodically over the life of the plan. Further, this is a plan for the entire institution, and our component schools and units should also engage in planning processes appropriate to their particular roles and missions.